During the coming winter full moon, in late January and early February, the normally solitary and territorial Nassau grouper will travel a long way to gather at a protected spawning site just off the west end of Little Cayman − one of the last healthy and active Nassau grouper aggregation sites in the Caribbean. Watching the activity carefully (as they have been doing for more than a decade) will be marine scientists and researchers of the Grouper Moon Project, a collaboration of the Cayman Islands Department of Environment (DOE) and the Reef Environmental Education Foundation (REEF), a marine conservation organization. Supporting the project is the Southern Cross Club, its staff and its owner Peter Hillenbrand, who also opens up his home to the researchers. For two weeks during the study Hillenbrand’s house is transformed into the project’s base of operations. An avid diver and conservationist, Hillenbrand is happy to share his personal space if it means saving his favorite fish. “Nassau grouper are beautiful, they have personalities and they can be like friendly puppy dogs,” he says. “Unfortunately these puppy dogs are easy to catch and taste very good.” Peter Hillenbrand pretty much sums up what has happened to the iconic Nassau grouper in the Caribbean. Overfishing has depleted traditional spawning sites to the point where most are dormant or extinct, which is why the Little Cayman site is so vital in conservation efforts to save the species. The Grouper Moon Project had its beginnings in 2002 after an estimated 2000 fish were taken from the unprotected Little Cayman site. To reduce fishing pressure and allow the Department of Environment to monitor the site, Cayman’s Marine Conservation Board implemented an alternate-year fishing strategy. In 2003 based on Nassau grouper population numbers, the decision was made to impose an 8-year ban on fishing the aggregations. The ban was extended in late 2011 and is set to expire in 2019. With a mission to understand the fish aggregation and take the necessary steps to protect the species, team members collect information and build a case on behalf of the Nassau grouper. Through the years the project has grown in scope and support, including research at historical aggregation sites in Cayman Brac and Grand Cayman. Current components include: acoustic fish tagging, genetic studies, satellite tracking of drifting baby grouper, juvenile habitat research and educational outreach. So far the protective measures introduced a decade ago are having a meaningful and positive impact − good news for the endangered Nassau grouper and all who care about it. This includes marine wildlife artist and conservationist Guy Harvey, who has helped spread the positive message through a documentary. Educating the next generation of Caymanians about the conservation work being done is important to the people behind the Grouper Moon Project. In advance of the aggregation, December workshops were held on Grand Cayman and Cayman Brac to distribute a marine science curriculum with lesson plans and free materials for teachers who want to introduce the Nassau grouper issue in their classrooms. 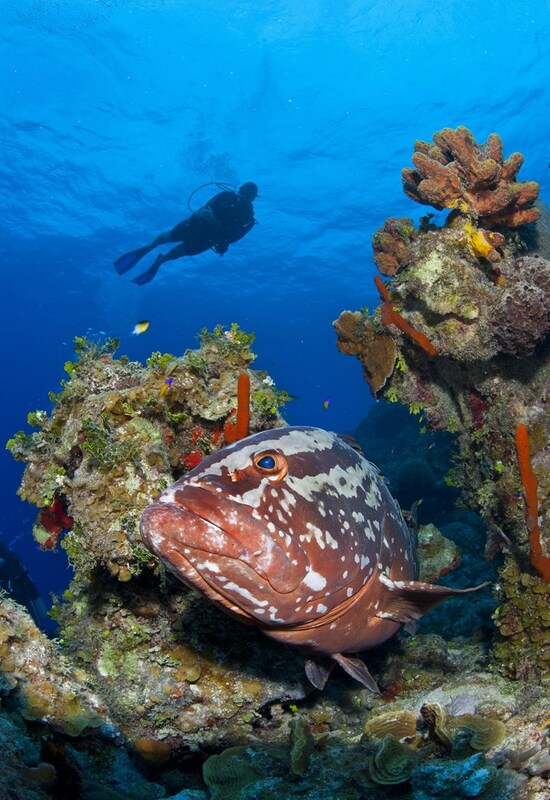 Students learn about the grouper’s historical role in Cayman, the serious decline in its population and the conservation challenges the species now faces. From their classrooms, schoolchildren will witness the aggregation and scientific fieldwork being conducted at the site via live video feeds to be streamed on online at www.REEF.org January 21 and 22. Christy Semmens says they want local schoolchildren to feel proud of the work being done in the Cayman Islands. “The Nassau grouper is such an icon for the Caribbean and it’s really a source of pride to have one of the healthiest grouper populations in the Caribbean, ” she says. Scientists and volunteers begin arriving on Little Cayman January 15 and they will stay for two weeks with a base camp at Peter Hillenbrand’s house , at they continue the work that has been going on for more than a decade. Researchers make several dives a day documenting the aggregation. They will come and go from the Southern Cross Club boat dock and have use of resort facilities for public presentations and other needs. Christy Pattengill-Semmens says the data and findings collected during the study are provided to DOE to review and consider as they make management decisions. Austin says science has also helped them conclude that fish eggs spawned in Cayman return as juvenile fish to Cayman because of offshore oceanographic conditions. Observations also help the department better understand how, when and why fish show up at certain locations, which helps protect the right areas at the right time of year. “We have learnt that grouper aggregations can move and so the original sites that we protected needed to be expanded to take into account the more subtle shifts in the peak density of the aggregation,” he says. REEF is a volunteer organization and DOE has a limited research budget, so the work carried out by the Grouper Moon Project depends on volunteers, donations, fundraising and grants. Supporting the study are Disney Worldwide Conservation Fund, Lenfest Ocean Program of the Pew Charitable Trusts, Scripps Institution of Oceanography, Oregon State University, among others. Christy Pattengill-Semmens and Tim Austin both say support from the community is vital. On Little Cayman they rely on help from the Southern Cross Club, the Little Cayman Beach Resort, Reef Divers and Peter Hillenbrand. This year the Southern Cross Club is also providing a dive boat for the project because the DOE boat is unavailable. On Cayman Brac, Brac Reef Resort has supported the educational efforts. On Grand Cayman, Divetech is helping DOE staff with technical training and equipment for research work on deep aggregations. Hillenbrand relishes the exchanges that take place on his porch during the grouper study and he’s happy to share his home for the cause. “The Department of Environment and REEF could not carry out the scope of meaningful and vital research work required to protect Nassau grouper without the considerable on-island support provided each year by Southern Cross Club staff and Peter Hillenbrand,” says Tim Austin. Project leaders say that ultimately protection of the Nassau grouper relies on everyone who cares about the species doing their part to save it, and then carrying the message and passion to inspire changes that are needed. The casually sophisticated Southern Cross Club Fish & Dive Resort is Little Cayman's original resort. It features 14 beachfront bungalows complete with a top-rated, professional in-house diving and fishing operation. A unique blend of rusticity and elegance the resort is often described as “Barefoot Luxury”. Guests can expect friendly and diligent service, delicious food, inviting rooms with breath-taking views and a comfortable dive boat ― a few of the things that bring them back year after year. Little Cayman is renowned for its breath-taking and pristine coral reefs and spectacular dive adventures. The resort’s beach-based location also provides flats fisherman with access to Bonefish and Permit just minutes away. Project photos: courtesy of the Grouper Moon Project and Phillippe Bush, Cayman Islands Department of Environment. Nassau grouper photo: courtesy of Alex Mustard.